Regardless of age, diet and exercise can benefit everyone by reducing the risk of many chronic diseases, improving mood, boosting energy and maintaining the ability to complete day-to-day activities. There are, however, a few special considerations for people over 50. Certain nutrients tend to be lacking in older adults, and a healthy diet should take this into account. If you are over 50, think about modifying your exercise routines in order to avoid possible injury and to address specific areas of concern. Consult your doctor before starting a new diet or exercise program. Aging causes a decline in the body's ability to process and absorb certain nutrients, calcium and vitamins B12 and D being chief among them. Many foods are fortified with these nutrients, such as cereals, bread, milk and milk products. In addition to getting those specific micronutrients, focus on eating primarily nutrient-dense foods such as vegetables, fruits, legumes and whole grains. A diet made up of whole foods will meet your body's needs for adequate fiber, vitamins, minerals, protein and carbohydrate while limiting excess calories from saturated fats and added sugars. Sodium intake should be limited to 1,500 mg per day for people 51 and older. One of the biggest threats posed by aging is the loss of muscle mass and strength, with adults losing up to 10 percent of muscle mass per decade after the age of 30. 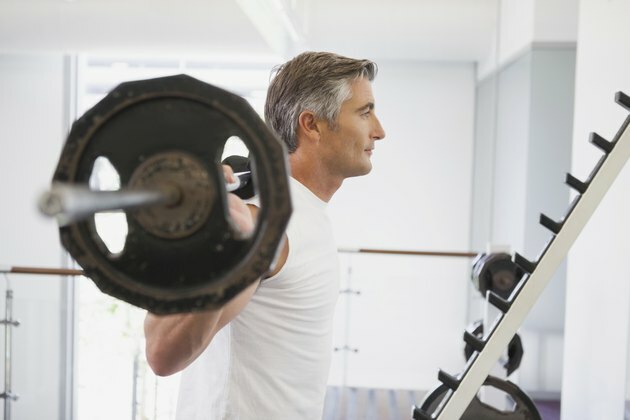 In order to stop losing and start building back lean muscle, the American Council on Exercise recommends completing a strength training circuit that targets all major muscle groups two times per week. Perform body-weight exercises such as squats, lunges, pushups and planks, and do moves such as overhead dumbbell presses and biceps curls using a weight that allows 12 to 15 repetitions for each set. Body-weight, free weights or machine exercises can all be effective, so it's really a matter of personal preference. There is an increased risk for heart disease, diabetes and high blood pressure that accompanies a general decline in activity, but this risk can be mitigated with regular cardiovascular exercise. In your 50s and beyond, you can participate in any activity you are healthy enough for, and should aim to build up to 30 minutes of aerobic activity on most days of the week -- the higher the intensity, the better. However, those with health issues will need to choose appropriate activities. Individuals with joint pain, for example, should choose low-impact or impact-free activities such as swimming, cycling, water aerobics and using an elliptical or rowing machine. While there is no single best diet and exercise plan for everyone, the American Council on Exercise reports that people over 50 can slow or even reverse the biomechanical and hormonal effects of aging by working up to and maintaining a high-intensity cardiovascular and strength-training program. Diet can also play an important role in slowing the aging process. A 2013 study published in "Lancet Oncology" found that a diet high in whole plant foods and low in fat resulted in positive changes to more than 500 genes.